May 24, 2011  Germans' famous passion for automobiles has run smack into EU directives to reduce carbon dioxide emissions. 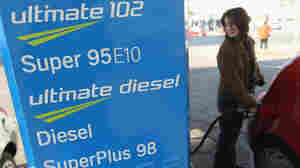 The government is offering a fuel mixed with 10 percent ethanol, but many drivers refuse to use it, despite its lower cost and reassurances that it won't harm car engines. German Boardrooms Lack Women. Can Quotas Help? May 17, 2011  Not one of Germany's top 100 companies has a female CEO, and women make up only 2.2 percent of their executive boards. Some businesswomen and legislators have proposed a quota system to remedy the imbalance, but some feel Germany's corporate culture isn't ready to join countries like France in embracing quotas. May 12, 2011  A German court found retired U.S. autoworker John Demjanjuk guilty of accessory to mass murder Thursday. Demjanjuk, who was born in Ukraine, served as a guard at a Nazi death camp during World War II, but there was no evidence he committed a specific crime. However, the court found that by volunteering to work at the camp, he had participated in mass murder. May 12, 2011  While the U.S., the U.K. and much of Europe brace for spending cuts and austerity, Germany's economy is growing. As manufacturers add extra shifts, there's a new shortage of skilled workers — leading to renewed calls to ease restrictions on immigration. 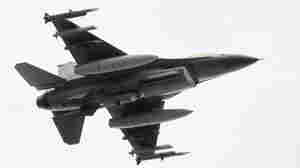 May 11, 2011  Germany's decision not to take part in the NATO air war against Libyan dictator Moammar Gadhafi may have cost the country political capital, observers say. And it could damage the country's efforts to win a permanent seat on the U.N. Security Council. May 8, 2011  NATO's chief of operations and intelligence says Moammar Gadhafi is now unable to effectively communicate with his forces in the field and is having problems resupplying his troops. But Maj. Gen. Mark Ramsay acknowledges that it's proving hard to destroy the weaponry being used to pound Misrata. 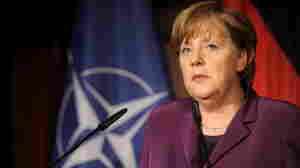 Has NATO Hit A Wall In Libya? April 15, 2011  President Obama and others say NATO and its partners must maintain operations in Libya as long as Moammar Gadhafi remains in power. But with rebels and Gadhafi's forces in a stalemate, there's concern the NATO operation may be insufficient to protect civilians — let alone force the dictator out. 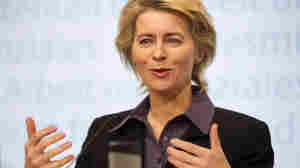 April 14, 2011  Secretary of State Hillary Clinton met with other NATO foreign ministers in Berlin Thursday. Top of the agenda: Libya and the concerns that the organization is not doing enough to protect civilians there. April 8, 2011  For much of Moammar Gadhafi's 42-year dictatorship, few Western tourists traveled around Libya. 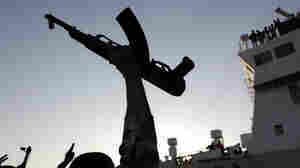 And now, amid the ongoing conflict between Gadhafi's forces and rebels, there are almost none. But one intrepid backpacker from Germany is defying the statistics. 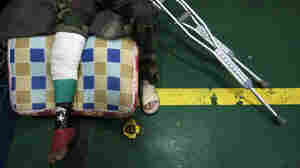 NPR's Eric Westervelt found him in eastern Libya this past week. April 6, 2011  Despite support from NATO aircraft, rebels in eastern Libya have failed to gain ground against forces loyal to Moammar Gadhafi. 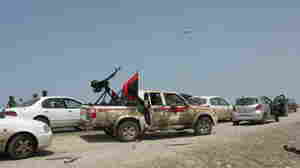 Tuesday, in fact, the rebels staged another small retreat from the oil port of Brega in the face of a heavy bombardment from Gadhafi loyalists. 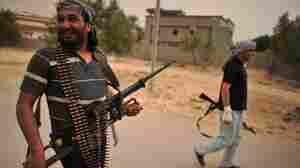 Meantime, in their self-styled capital of Benghazi, rebel leaders met with a U.S. envoy. April 4, 2011  The rebels' last enclave in the western part of Libya, Misurata, is under attack from Gadhafi forces. Wounded civilians and rebel officials who have fled the city say that hospitals have been targeted. April 1, 2011  Rebel fighters aren't waiting around as an international coalition debates whether to arm them in their struggle against Col. Moammar Gadhafi's troops. They've ramped up a crash training course for volunteers in hopes of better organizing their improvised army.